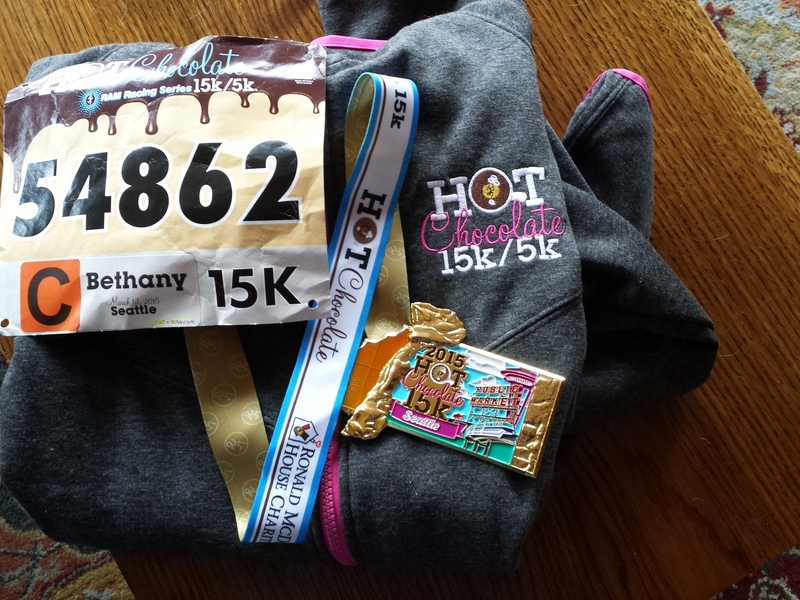 On Sunday I ran the Hot Chocolate 15k in Seattle. This is a large race, 7,000 in the 5k and 5,500 in the 15k. I have run this race the past 3 years and each year say I’m not going to run it again. It is a hard, hilly course. You are going up or down the whole 9 miles nothing is flat. But the chocolate is always a draw for someone I know. 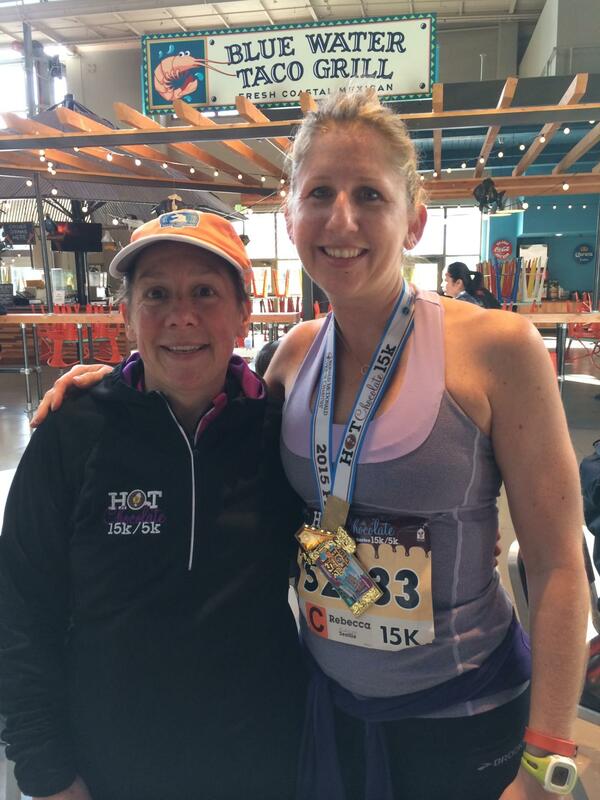 Last year my sister, Pam came from Boston to run. 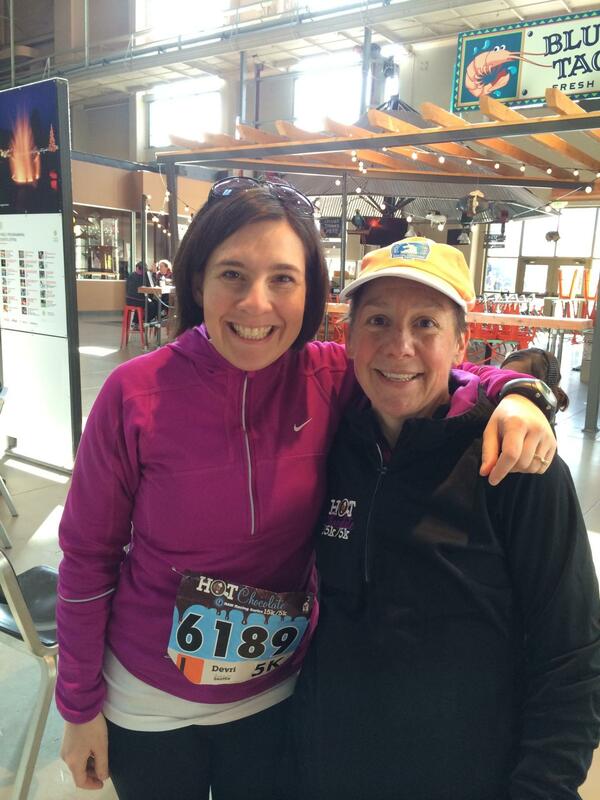 This year my friend, Devri and her husband, Barry came up from Oregon to run the race. The 5k has a very early start of 6:45, the 15k 7:55. The only issue was the traffic off Mercer St. But we headed up a side street and got free parking about 3 blocks from the start. Devri even had time for a bathroom stop before her corral started. For a big race it’s very well-organized. Easy gear check, plenty of port-a-potties and you can wait inside at the Armory. The weather was about 40 and beautiful blue sunny sky. We started on time and the first bit is a few very steep downhills. I like to go all out on the downhills, and it was still pretty crowded so I was also weaving in and out a bit. There is not a lot of crowd support but the volunteers are awesome. Most had cow bells and shouted cheers along the way. About mile 3 my friend Rebecca comes up beside me, what a great surprise. I didn’t know she was running this race. We ending up running the rest of the race together. We chatted very little as we were both running at a very good pace for us. I told her she was going to be my rabbit, but to run at her pace. She ended up pulling slightly ahead in the last third of a mile, which was up hill, and I was running out of steam. Finish time 1:23:29 a PR and top 10% in my new age group. Thank you Rebecca for pushing me! At the finish there are cups of Gatorade and bottles of water. We also got metals this year. The finish shoot is organized and quick. You have a ticket on your bib for your mug of goodies. Everyone gets one. There is no taking 8 for your whole family and leaving none for the runners behind you. Thanks Devri for the pictures! This is a great race, anyone from Boston want to come out to run it next year? 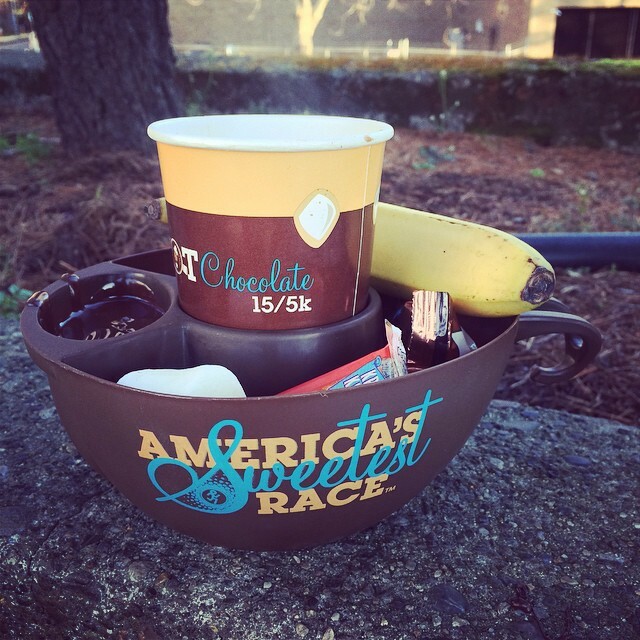 This entry was posted in Uncategorized and tagged Hot Chocolate Race. Bookmark the permalink. Shannon, you and Joe are welcome any time! Congrats on your PR! Sounds like a great race, I really need to try it next year. That cup of goodies looks amazing!